Turo: the company that lets you rent your personal car out for money. Sounds pretty straightforward, right? But then there’s always the question of what happens when someone crashes your car. Turns out, if you own a supercar like an Audi R8, it’s not the easiest thing in the world to clear up. Phillip Stephen and Stefan Toussaint are the owners of that R8 in the Washington D.C. area. And they say after their car was crashed in a Turo rental, they’ve had one fight after another over compensation, and now they say renting your exotic out with the service may not be such a great idea. The car was listed on Turo the following month and did well, because of course it did. Most people would love to drive an R8 for a weekend. It was even featured on Turo’s Instagram. The last rental was Oct. 26 to a local user in Maryland for two nights. Photos of the R8 were taken the night before the car was loaned out. Stephen said that the car was due back the evening of the Oct. 27. He was waiting to meet the renter at the R8's garage but got a call about an hour or two before it was to be dropped off. It was the renter, calling to let the owners know that he’d been in an accident. He was unharmed, but the car was damaged pretty badly. They were “bummed” about the crash, but were mostly happy that nobody was seriously hurt. Cars are replaceable, after all. The next day, Stephen went down to the tow lot and took some photos of the car. As you can see, the front was basically gone and the car suffered extensive frame damage. As of this writing, Stephen and Toussaint have requested an official copy of the police report and have yet to receive it. The next step was to reach out to Turo to file the claim. After calling Turo three times, Stephen and Toussaint were finally told that their case would be handled by a third party insurance company, Littleton Group. Stephen said that even with a representative walking them through the claims process on the phone, it still wasn’t very informative. Finally, after a month of back and forth, they received a determination—the car was a total loss—and an appraisal for it. But the report came back with the R8 severely undervalued, at least as far as Stephen is concerned. 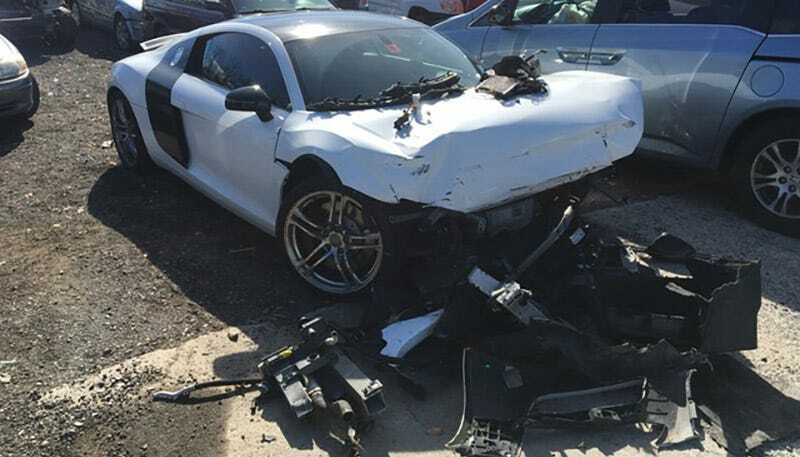 He insists that his R8 was in excellent condition before the crash. He sent in some supporting documentation for a more accurate report and waited some more. At the end of the year, the adjuster came back with a corrected report, but still with the R8 undervalued by about $12,000 to $16,000, the owners said. This discrepancy is due to the fact that Turo doesn’t pay to replace cars that suffer extensive damage. It uses Actual Cash Value, which is determined by subtracting depreciation from replacement cost. Turo offers three vehicle protection plans for owners: “Premium”, “Standard”, and “Basic”. A rental car company that can offer commercial rental liability insurance directly to their travelers and for their vehicles may also choose to decline a Turo protection package. All three Turo plans (Premium, Standard, and Basic) provide $1,000,000 in liability protection, but differ in other ways, particularly how physical damage is covered. If an owner chooses to decline a Turo protection plan, they must provide commercial insurance that is verified by Turo prior to the owner renting out their vehicles. In the event of a loss that is covered by this Agreement, Turo, its insurers, and/or its adjusters will, at their option, pay you either the reasonable and actual expenses of repair of the vehicle or the actual cash value (“ACV”) of your vehicle (if, for instance, the expected cost of repairs exceeds 75% of the ACV of the vehicle). Furthermore, because of this, there is a possibility that an insurance company can value the car at its own discretion. Stephen thinks this to be the case. In the email exchange with Littleton, Toussaint raises concerns that many aspects of the R8 were misreported, including mileage adjustment consistencies and overall quality disagreements (Toussaint insists that most of the car was in “Dealer Ready” condition, whereas the report lists it as “Normal Wear”). When the two asked how the numbers were determined, the adjuster told them the determination was made by Turo for deductions like mileage, wear and tear, body, etc. After speaking to Turo, Stephen says he was told that the determination was made by the adjuster. To him, it’s been a non-stop game of finger-pointing. Turo determines a vehicle’s value with software from CCC—this is software that is commonly used by insurance carriers. We use a licensed third party administrator to ensure that all claims settlements are compliant with all state departments of insurance. This particular host felt that his car was showroom ready, but our independent appraiser determined that it didn’t meet this condition. We have also reached out to Littleton Group for comment and will update if we hear back. Could Stephen and Toussaint have sensed the red flags earlier on when the ACV policies proved to be difficult to find? Probably. All of the relevant and necessary information does exist on Turo’s website. Admittedly, though it did require some hunting, it’s still there. You’d think that loaning out something as expensive and special as an R8 would require its owner to take some extra precautions. But then again, you’d also think that when a company cheerfully insists, “Let your car work for you,” things like insurance when things go horrifically wrong (which, statistically they will) would be more clearly explained and carried out. Update: To clarify, Stephen and Toussaint say that they were not able to decline Turo’s protection plan in favor of their own commercial-level insurance, as that wasn’t an option during at the time. Overall, the two were most bothered by the lack of transparency regarding this issue.